Patrick Grieshaber: “I have the sense that the Lord called me to help the poor and to serve in Blind Eye (Ministries).” Photo: Peter Bugden. LIKE many young men his age, Patrick Grieshaber is at the point of tearing his hair out over the Brisbane Broncos’ form struggle. “I’m even thinking of putting on a jumper myself …,” the 22-year-old said, indicating his frustration at seeing the champion National Rugby League club outside the top eight after 10 rounds. Patrick, like many young men his age, has more important things on his mind, though. Top of the list is finding a job. What may set him apart from some others in that struggle is that he’s not one for giving up. Patrick’s had the odds stacked against him from birth but has not let that stop him from achieving. 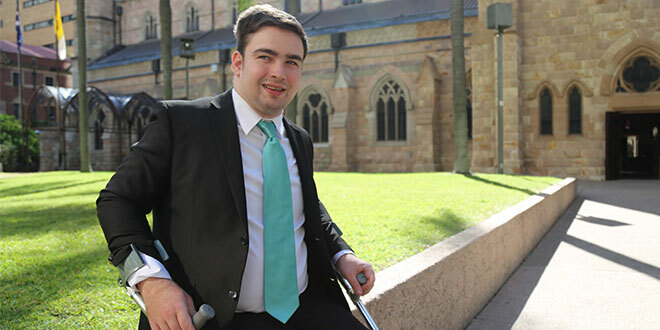 He was 18 months old when he was diagnosed with cerebral palsy, and his parents, Patricia and James Grieshaber, had him enrolled at Xavier Special Education School at Coorparoo so he could get the help he needed. “Before I went to Xavier, doctors said that I would be not able to walk or talk,” he said. “They said, ‘Continue with therapy and you should be right’, but they didn’t really expect him to do as good as he did; and that’s really thanks to them persevering with him at Xavier and us persevering with him at home, and taking him to therapy and things like that,” she said. Patrick did so well he was able to transfer to mainstream schooling and went through to complete Year 12 at Whites Hill State College. It’s a sign of how determined Patrick can be. “Well, you sort of have to be – especially with my disability – you have to be determined to achieve those goals,” he said. Another of Patrick’s assets is his strong faith, especially during May ­– the Month of Mary. His mother is president of the Legion of Mary group in Our Lady of Graces Parish, Carina, and Patrick is vice-president. “I have a strong devotion to Our Lady. I’ve always had it,” Patrick said. Patrick said faith was all-important to him. “Without my faith I don’t know where I’d be,” he said. Patricia, who also has cerebral palsy, said it was fortunate for her and her son that strong faith had been passed down from her parents. “I had great parents that brought me up to know that God’s always there, and I hope I’ve passed on some of the values to Patrick that he knows … to place his hope and trust in God,” she said. And he’s passing this on to others through volunteering weekly with Blind Eye Ministries, a grassroots Catholic outreach to the homeless and marginalised in South Brisbane. He was inspired to join the group when he came across the Blind Eye stall at an Ignite youth conference more than three years ago. Moved by the experiences people had dealing with different aspects of homelessness, “dealing with the different struggles of life”, Patrick felt “very deeply the call to help and serve the poor”. “I have the sense that the Lord called me to help the poor and to serve in Blind Eye,” he said. And what keeps him going is “the joy of seeing people be happy”. “Some of these people can come down and be very, very weighed down with the pressures of the life, and when you just show love and mercy to them, that lifts some of the pressure,” he said. Patrick likes the fact that Blind Eye Ministries is so practical. “Blind Eye’s one hundred per cent practical,” he said. Patrick’s practical about his job-hunting as well. Asked what would be his ideal job, he said he would try anything. “My ideal job would be somewhere where it’s just a nice environment to work in,” he said. “Office would be the main preference but you can’t be too rigid these days. You’ve got to get the job that you’re offered. “I have done study in business before. I’ve also done quite a lot of study in computers. Patrick’s worked as a volunteer in a workshop for two years, packaging, filing and mailing. “I have been working in a call centre, as a volunteer,” he said. For a young man who may never have had the chance to walk and talk, there’s no limits.